As I type this post Mothers Day has dwindled away, but the sentiment is still plenty valid. My mother has always been there for me, been someone I could count on, and I love her for that. She also has unwittingly helped foster my writing by being an avid reader. Having books around helped to show me that there was a market for good stories, and having her buy the vast majority of her novels the past year or so through her e-reader made me inquire about publishing to them, eventually leading me to discover the e-publishing process. So I thought what better way to show my mother how much she means to me than making her a present that she can use and that will also show a deference to the past of literature with a transition to the new. 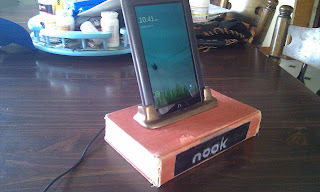 I decided to build her a charging dock for her nook color, and I would use an old novel for the base. It was a fun project, and one that works as well-charging her nook color overnight while it is in sleep mode while keeping it upright and away from spilled drinks or falling candles, etc. I believe that reading needs to be brought to more and more people, as it's popularity in the age of facebook and youtube has been dropping among the most recent generation. One of the ways we can do this is to reintroduce the "novelty", if you will excuse the pun, of the reading experience in fresh ways, such as e-readers and the audio book format. Audiobooks in mp3 are a great way to carry your fiction with you on the go, and despite the new delivery mechanism the essence of the experience, the interpretation and re-imagining of events through the prism of the readers mind persists. With a little effort, some fresh ideas and a healthy dose of enthusiasm, we can bring reading to this generation like my mother has to me. So Happy Mothers Day Mom. Enjoy your one of a kind-handcrafted with love nook charging dock, and I hope it serves you half as long as the gift of reading will me. Checking out those FB photos I am amazed at how much you actually fabricated. I thought the slot was premade/purchased, but it looks like you molded it yourself. Impressive sir. You're like Macguyver and the A-Team all wrapped up in one! Lol! Yeah, I molded it out of Super Sculpey, it's awesome stuff. 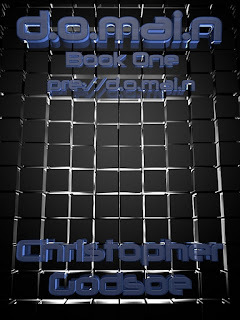 It's fun to screw around with different stuff, I like being creative in different mediums, it helps to keep your mind open to new ideas and makes it easier to describe things in prose if you know a little bit about how it works. We have a saying in my family, "Don't pay someone else to build something you can do yourself". Thanks for taking the time to check it out and comment, and I hope Jenny enjoyed her Mothers Day! Thanks for the info/links. That dragon head is amazing. You did that freehand? The wood processor vid was soothing to watch. I don't know why. Must be a guy thing. Haha! You should either devote another blog or atleast an occassional post here to this stuff. It's pretty interesting. Thanks again for sharing! Yeah, it took a little bit to get it to where I wanted it, but I'm happy with the way that it came out. The ladybugs on the other wand were alot of fun as well. And I think it's soothing to watch for us guys because we remember as kids having to do most of that work by hand, and now it's just a few lever presses, LOL. I plan to add another page to the blog up on the menu, basically just a catch all to contain all of the weird projects I commit myself to, I just need to get some pictures together for it.